One of our favorite ways to give your veggies a fun makeover is turning them into vegetable noodles with a nifty spiralizer. But what really excites us is the creativity that people put into making food creations that incorporate these fun, spiralized vegetables. Check out this massive list of vegetables that you can spiralize, along with some tips to make the most of these vegetable noodles and some delicious spiralizer recipes you can make from this wide range of ingredients to give a twirl. 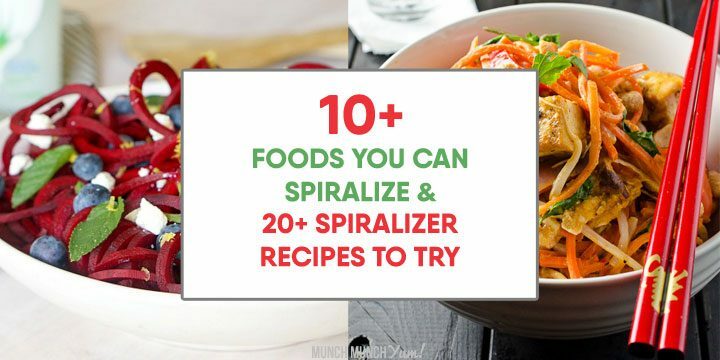 There are several ways to approach this both with and without an actual spiralizer. 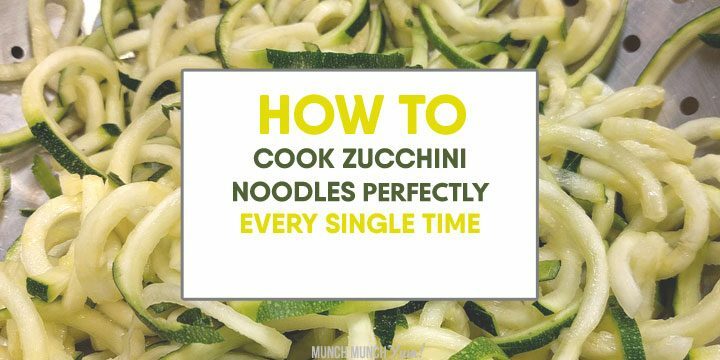 We delve into the pros and cons of each in our dedicated post on how to cook zucchini noodles. We even cover the most common problem people encounter: soggy noodles. Since you are working with a vegetable that releases a lot of moisture during both the spiralizing and cooking processes, be sure to check out the section on tips for how to avoid ending up with a wet, mushy mess. Because sweet potato is a pretty sturdy vegetable, don’t be shy about the amount of pressure you apply during the noodle-making process. Just remember: after it’s spiralized, the resulting noodles are fairly delicate, so you do need to be gentler during cooking. We didn’t want to leave out regular white potatoes from our spiralizer recipe list, since they too can be made into their own delectable dishes. Like sweet potatoes, you don’t need to be so soft during the spiralizing process, but handle the spiral noodles with lots of care when you are cooking them. The process for spiralizing regular potatoes is not much different from how you would handle sweet potatoes. Just follow the same tips from our prior post on spiralized sweet potato recipes. It’s common to find julienned carrots in dishes like salads and Asian stir fry, so why not try them in spiral form? Once you get the hang of using a spiralizer and are no longer afraid to apply more pressure as you spiralize your veggies, be sure to give carrots a shot. Like a lot of vegetables, this one is pretty simple to spiralize. Just peel the carrot and slice off both ends so that it’s flat enough to put in your spiraling machine. Again, don’t be afraid to apply pressure to get perfectly cut carrot noodle spirals. You can enjoy your carrot spirals raw, or if you’re wondering how to cook carrot noodles, you have several options. The one that produces the best flavor overall is roasting, which you do at 425 degrees for about 8-10 minutes. Spiralized carrots can also be sauted for 5-8 minutes, or you can boil them for about 3 minutes. Whether it be spaghetti squash, butternut squash, or yellow squash, making squash noodles is pretty similar to zucchini (which also happens to be a squash). The tips we shared on how to make zucchini noodles with or without a spiralizer are pretty much the same for these guys, since they both work nicely in a spiralizer. Whether you choose to make thick or thin squash noodles, you’ll have fun turning these veggies into all kinds of dishes. Not everyone loves broccoli stems, but spiralizing them is a way to up their cool factor and inspire you to keep from throwing them out. You’ve probably figured out that we’re working with broccoli stems here, instead of the florets, to make noodles from broccoli. Therefore, you’ll want to pick bunches of broccoli that have wider and straighter stems (to fit more appropriately into a spiralizer). Separate the stems from florets completely before you put them through the spiralizer to make it less messy. The trick to spiralizing broccoli is to be swift and strong about this. Because these stems are sturdier, you can cook them in a skillet and they won’t fall apart as easily as other veggies might. Plus, they absorb flavors wonderfully, so you should definitely give this veggie a try. One of the easiest ways to come up with uses for spiralized broccoli is to start by thinking of dishes that you already know broccoli works well in. Then, add in the spiralized broccoli stems for a new twist, literally! This vegetable makes for a delicious raw addition to salads or pastas. It’s possibly the easiest, no-fuss veggie to prepare since you don’t need to do anything beforehand and no cooking is requiring. Like we’ve mentioned for other veggies, finding cucumbers that are long and straight would work best in the spiralizer. The fact that peeling is 100% optional also adds to the easy factor. The only thing to be aware of is that cucumbers naturally release A LOT of water. Just let it sit awhile and pat dry with a paper towel before adding spiralized cucumber to your dish. Not only do beets add a wonderful color to your dish, they sure do beat (we just love puns!) having to eat the same old vegetables again, don’t they? Like carrots, peel and then slice the ends off so they’re flat and even. As for cooking, we prefer them roasted, which only takes about 8-10 minutes at 425 degrees. You can also saute them for about 6-8 minutes, boil for 3 minutes, or even serve them raw. Eggplant can be difficult to spiralize because it’s pretty soft compared to other vegetables and it has a lot of small seeds that are hard to pick out. The truth is, if you try to spiralize it in a handheld or electric spiralizer, you aren’t going to get much out of the eggplant and will end up with a lot of scrap pieces. For these reasons, most people actually prefer to use a mandoline, julienne slicer, or plain old knife to make their eggplant noodles. Since we hate food waste, we urge you to use whatever leftover eggplant you have in any recipe that uses cooked eggplant, such as zaalook or ratatouille. As long as you have a way to use the remaining eggplant, then why not give eggplant noodles a try? Another popular vegetable-as-a-starch trend is cauliflower rice, which is something your spiralizer can easily help you make. In a nutshell, you can make cauliflower rice with your spiralizer by: cutting off the leaves, sticking a chopstick into the bottom of the stem, theninserting the chopstick into the blade end of your spiralizer so that it helps hold your cauliflower in place as you crank. This is one of those things that’s easier to understand when you see it in action, so check out this great tutorial on YouTube. Cauliflower “rice” pieces you can be used for a wide variety of recipes, not just rice-inspired ones. Try out these two entrees to see what we mean. Bell peppers have a funky core that you have to account for before you can successfully spiralize it. Fortunately, all it takes is cutting off the top end, carefully pulling out the center and shaking out any fallen seeds, then setting it against the spiralizer like usual and cranking away. Most people are used to adding thinly sliced red onions to salads, but spiralizing gives them a little bit of extra visual pizzazz. 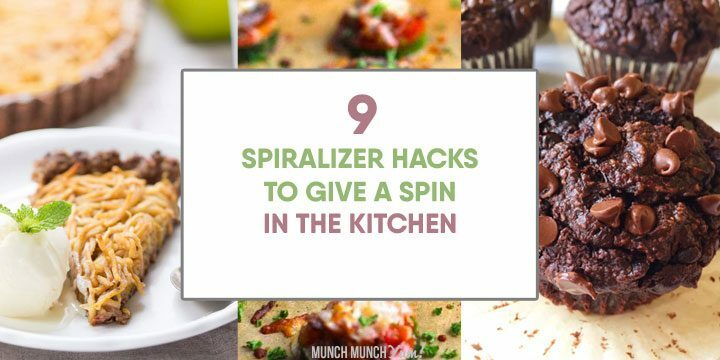 They are super easy to use with a spiralizer since onions are very firm, so there’s no reason not to give them a whirl too. Using a spiralizer on onions only requires you to peel, insert, and crank. Red onions are mild enough to eat raw or you can cook them like how you normally would prepare thinly sliced onion such as quickly sauteing them. There is practically no limit to the types of vegetables you can spiralize. With a little imagination, you can make spiralized vegetable noodles out of practically any produce you come across. We hope this massive list of vegetables to spiralize has inspired you to think of new ways to add a pop of fun to your dishes with spiralized vegetables. Don’t be afraid to give all your vegetables a turn on your spiralizer!